Earlier this week PFI Chairman Stan Elliot reminded me that in just over two weeks our board would gather in Nashville-and my first public appearance as the Executive Director of the PFI, and our collective appearance at an important industry event, the Hearth, Patio & Barbecue Expo, would all be in the rearview mirror. I couldn't be more excited. It's become more and more clear to me that those three days in Nashville are going to be an opportunity for incredible momentum for our organization and we're at work to make sure we make the very most of the opportunity for the PFI. Don't forget to send us photos of your product, mills and people so we can feature them at Breakfast & Biomass! Submit photos for a free t-shirt. 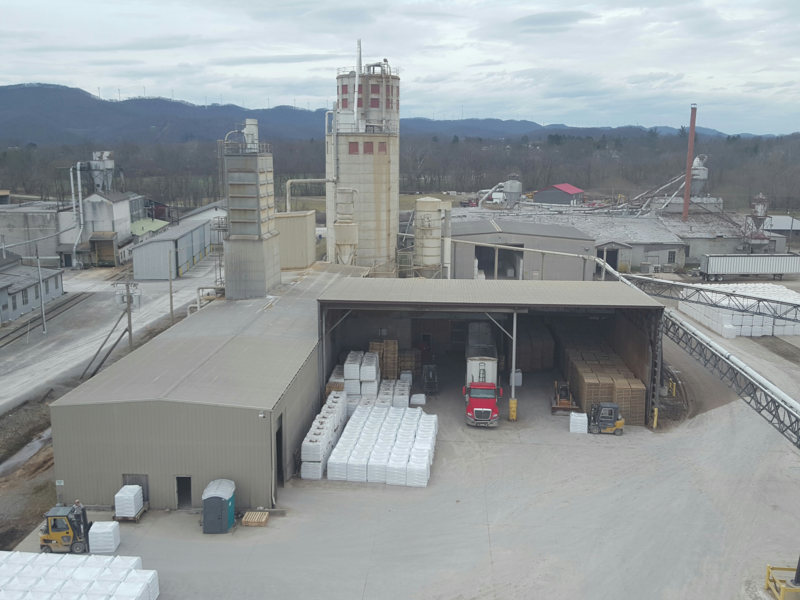 Thanks to Lori Hamer of Hamer Pellets for the above photo of Hamer's Elkin, WV pellet mill. Our Breakfast & Biomass session is going to be a good one. By the time you read this, we'll have had our first conference call as a panel to discuss our objectives, our presentations, and how they will all work together to drive the message home that the PFI is committed to more aggressively and more strategically marketing our product. It will be my first time meeting some of our members and board members. I thrive on personal connections. I'm energized by the work others are doing to run their businesses and prosper as business owners. While I'll return home from Nashville exhausted, I'll be refreshed and energized in a way that only interacting with industry colleagues face-to-face can deliver. Networking with our marketplace partners. I know already that I'm not going to speak to everyone I'd like to in Nashville. There's just not enough time. I want to talk to appliance makers (heating and grilling). I want to talk to hearth retailers. I'm curious about the presence of larger, broader retailers (farm and ranch stores, home improvement chains). See what I mean? Along those same lines I'm really excited that Jack Goldman, the President & CEO of the HPBA, and I are going to get a chance to meet. Jack and I have spoken already since I've taken over as Executive Director here at the PFI and I really like Jack's passion for the sector. I'm looking forward to meeting him personally and sharing my passion for our industry with him. I'm looking forward to expanding on the relationships I've begun to build in the hearth and home media community. As a guy with roots in trade media, I know the value of having strong relationships there. I need to wrap and you all need to get back to your Friday. I'd be remiss if I didn't share with you all that I began my week at a member facility, Snow Timber Pellets in Hurley, Wisconsin. Hurley is the last town in northern Wisconsin before crossing over into Michigan's Upper Peninsula. It is a wonderfully unique part of the Upper Midwest I personally became acquainted with just a few years ago. Brady Francois welcomed me to see the facility as I was on my way back from a short family ski weekend. I'll have more on our visit next week, but suffice it to say that Brady has only stoked my belief that rural manufacturing jobs are absolutely vital for our rural places and people. Every year, several thousand tons of treated wood waste is buried, incinerated, or mixed with untreated wood waste. The management of this waste is problematic because treated wood contains preservatives such as arsenic, chromium, and copper to slow its deterioration. To remedy this, INRS researchers have found a simple, effective, and environmentally friendly solution. They have developed a process that successfully removed more than 90 percent of the contaminants present in treated wood waste in experiments conducted on a small scale in the laboratory. Thanks to an Idea to Innovation Grant from the National Science and Engineering Research Council, professors Jean-François Blais and Guy Mercier and their team will be able to assess the performance of this process on a larger scale in order to determine its technical and economic feasibility. "Power to the pellet." That's what they say at Racine-based Cookinpellets, a small but growing company whose owners now also run a north-side business incubator and commercial-tenancy building. Cookinpellets is coming into its 12th year since it was founded by co-owners Chris Becker and his wife, Julie. During that entire run, the company has averaged 65 percent growth per year, Chris said. The Beckers also own Trademark Graphics, which Chris says is the oldest U.S. fleet graphics company for police and sheriff departments. Cookinpellets manufactures and ships premium wooden pellets for pellet grills, grills that can serve as both grills and smokers. Besides meats, Chris said he's used his pellets to bake pizzas, pies and chocolate chip cookies. He said Cookinpellets are made from sustainable forests in Michigan, where the company also manufactures them. Then they're trucked to Racine for packing and shipping. On July 5, 2010, a wood pellet silo in Norway exploded when firefighters released inert carbon dioxide into the headspace to lower the oxygen content and suppress a smoldering fire. The lesson from this incident is that the use of carbon dioxide to suppress silo fires is unsafe. Smoldering fires produce flammable pyrolysis gasses. The gasses can travel and accumulate, for example in the headspace of the silo. The release of carbon dioxide from high-pressure cylinders can generate static electricity with sufficient energy to ignite the pyrolysis gases. Smouldering fires in wood pellets storages can occur for a number of reasons. There are plenty of examples in industry where pellets self-heat deep inside an undisturbed pile. Another known cause is mechanical friction heat in, for example, a roller bearing, which can ignite dust particles. Embers can be difficult to detect and they can travel in conveyor systems and start fires in storage areas.